The first time I laid eyes on Holy Cross Tagaytay, I knew I was bound to get an up close look of it before the year ends. Even though the folks in Lataban didn’t know much about it, I had a positive and inexplicable feeling that I would soon have a close encounter with this eye-catching sight. With its towering crucifix and perfect overlooking location, the photogenic landmark was simply hard for me to resist. 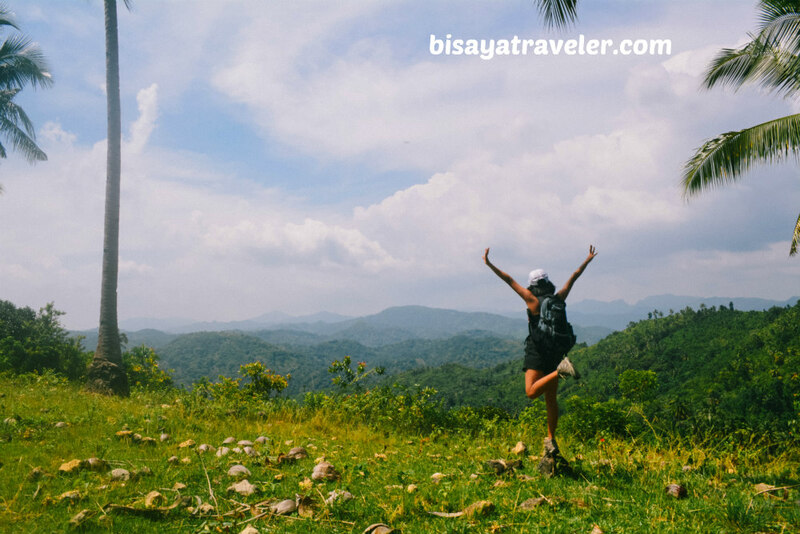 And when you’ve got a restless adventurous spirit, sometimes you feel like there’s no mountain high enough, or no remote land that’s unreachable by foot. 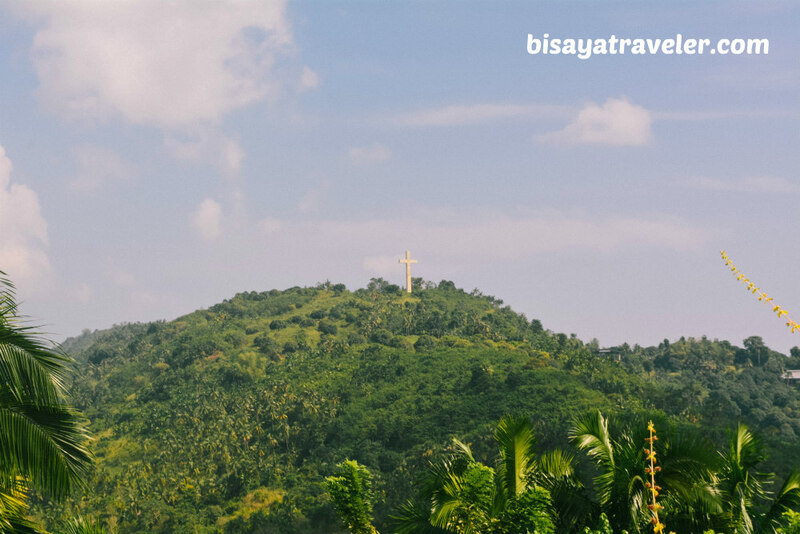 A few months later, I found myself speechless and gazing in awe at the gigantic Holy Cross of Tagaytay, Compostela. 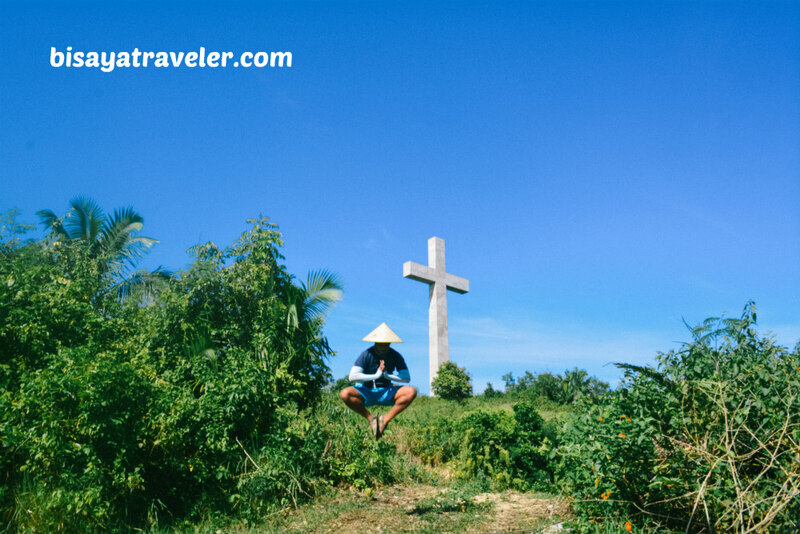 With an impressive height of at least 30 feet, Holy Cross is, hands down, the largest and most breathtaking crucifix I’ve ever seen in the entire province of Cebu. 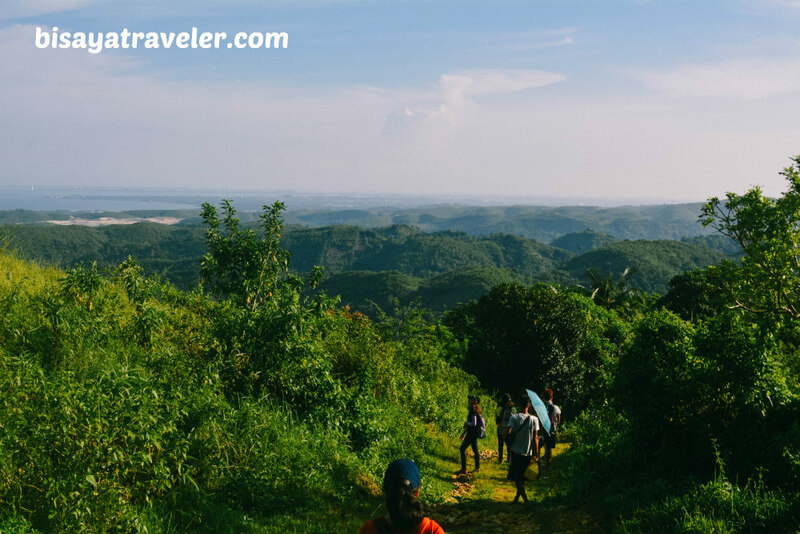 As an added bonus, Holy Cross offers a striking overlooking panorama of Compostela and some parts of Metro Cebu, making our day hike even more pleasant and memorable. 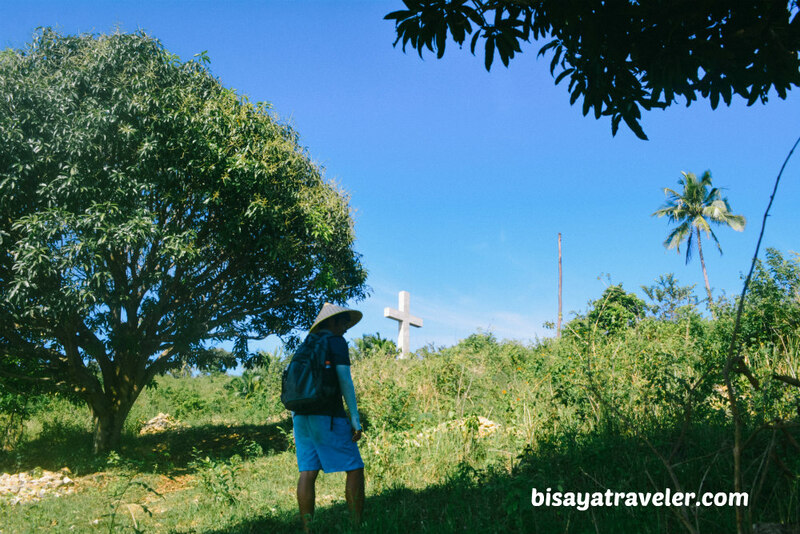 Truthfully, Holy Cross Tagaytay wasn’t in our initial plans during our hike in Compostela. 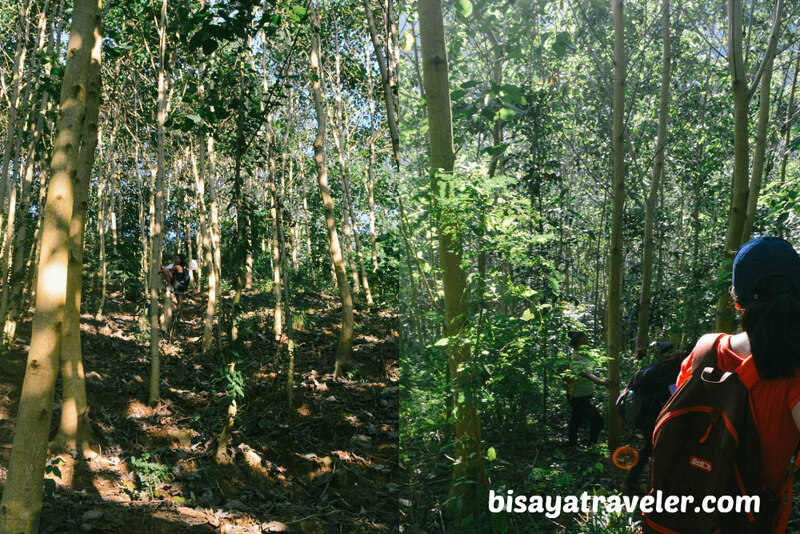 Originally, our plan was to check out Buntod Panangban, and from there, take a 2-hour hike to Mulao River. But, that’s the beauty of having an open itinerary with a group of no-frills open-minded adventurists. Whenever we “accidentally bump into” (Idol’s famous tag line) a wondrous surprise, we adjust our travel plans, roll with the punches, and let everything fall into place. And speaking of Team Bang, there were 9 of my club’s members who tagged along for this day adventure – Christine, Shenyl, ate Sherlyn, sir Juan, Shiela, Jovy, Francis Paul, Maria Salve and the legendary vibrant chick magnet, Idol. 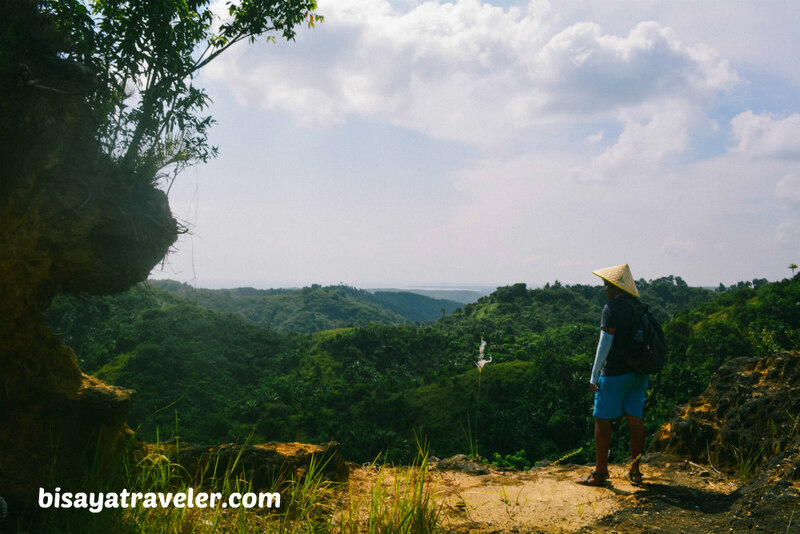 To make things even better, we were guided by fellow blogger and adventurist, Demi of Ace and Demi Travel Stories, and a few of her charming relatives. 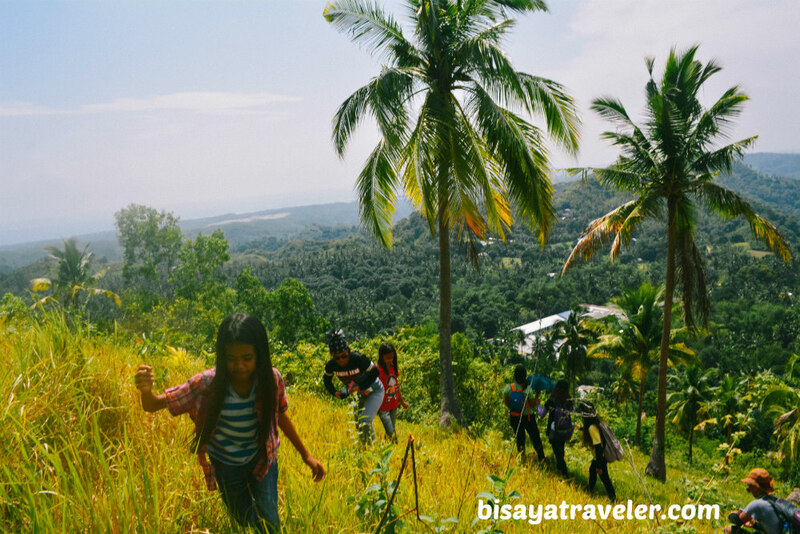 Our hike to Holy Cross started with a rendezvous at Sungold near SM City Cebu. Except for Jovy, everyone was on time for our day hike in Compostela. I guess Jovy was a little busy doing her laundry or playing with her puppy, the night before our hike to Holy Cross Compostela. When she finally arrived, we didn’t waste any moment, hopping on a crammed jeepney bound for Compostela public market. As for the jeepney ride, it was rather fun, even though it was rather crowded. Not only was it nice catching up with the team, but the jeepney also has a Wi-Fi connection. No kidding! As a matter of fact, our future vlogger, Idol, went live on Facebook, introducing the members of the group one by one, and sharing our experiences on our way to Compostela. Upon arrival, we were greeted by Demi’s “yo-yo” (or uncle in English), who, with a few of his fellow riders, drove us to their home at Dikyop, Compostela. Afterwards, we were warmly welcomed by Demi and her relatives, and were treated to a filling and delicious tasty snack combo of kamoteng kahoy (cassava) and cooked saba banana. 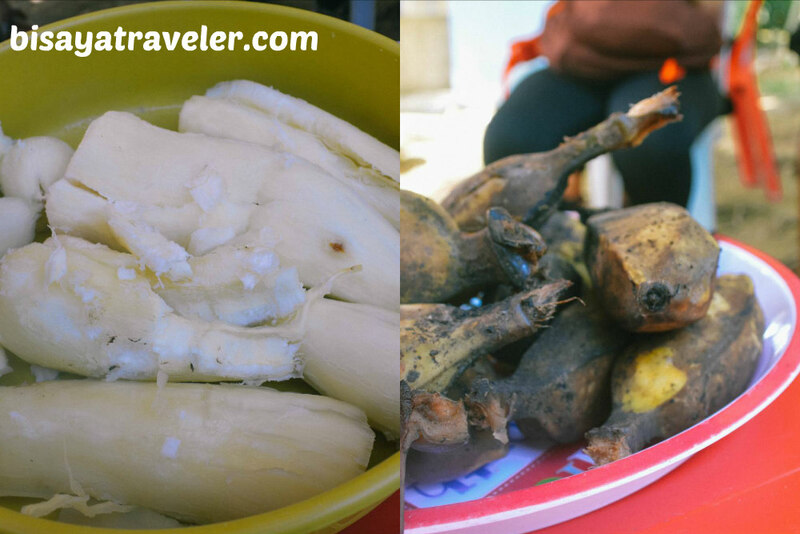 How tasty was our traditional Cebuano snack? Try asking Francis Paul. I’m pretty sure he did enjoy every bite of the snack that Demi and her accommodating relatives gave us. Led by Idol, we, then, kicked off our hike in Compostela, with a short yet meaningful prayer. 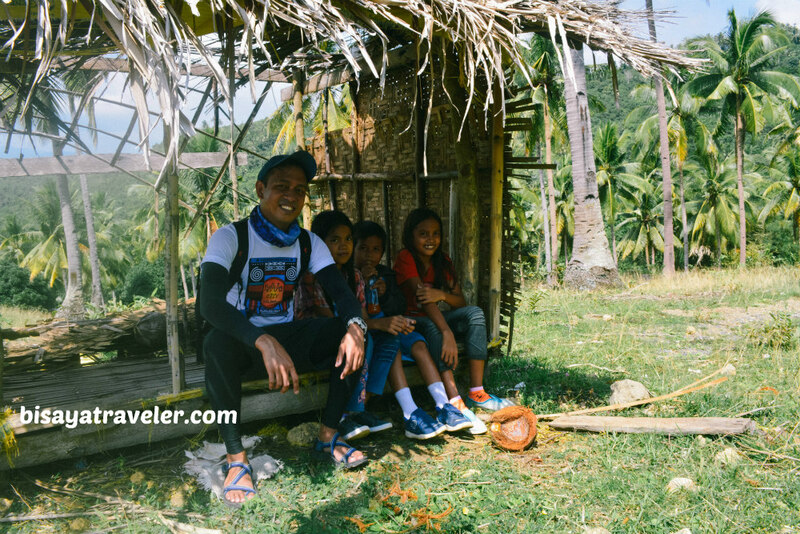 With the guidance of Demi’s uncle, we took on the concrete road leading to the first stop of our adventure – Buntod Panangban. There were some little ones – Demi’s nephews and nieces – who tagged along for the hike too, making our adventure more colorful and fun. Along the way, we caught sight of the Holy Cross from afar, luring us with its enormous landmark and lovely vantage point. “That’s the immense white crucifix that I saw on my hike from Lataban to Kan-insid”, I said to everyone in my team, while pointing on the Holy Cross. 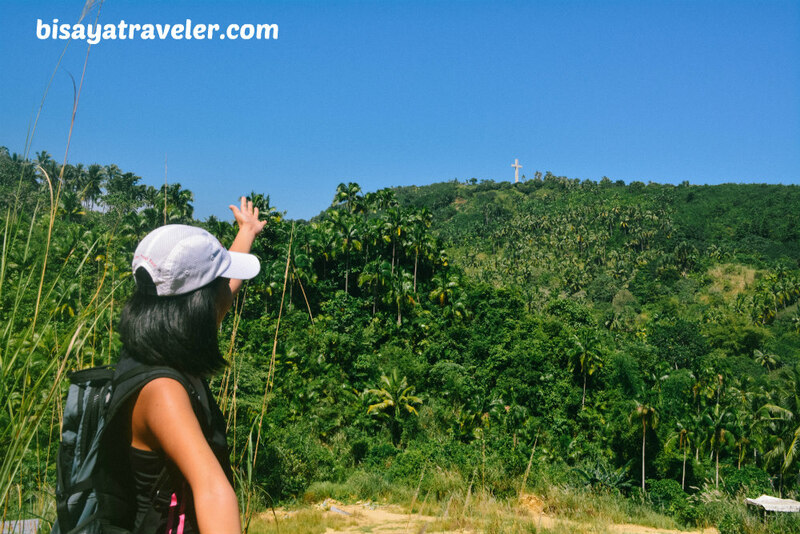 Of course, like any curious hiker, I asked plenty of questions about the Holy Cross to Demi, as we were hiking in Panangban. 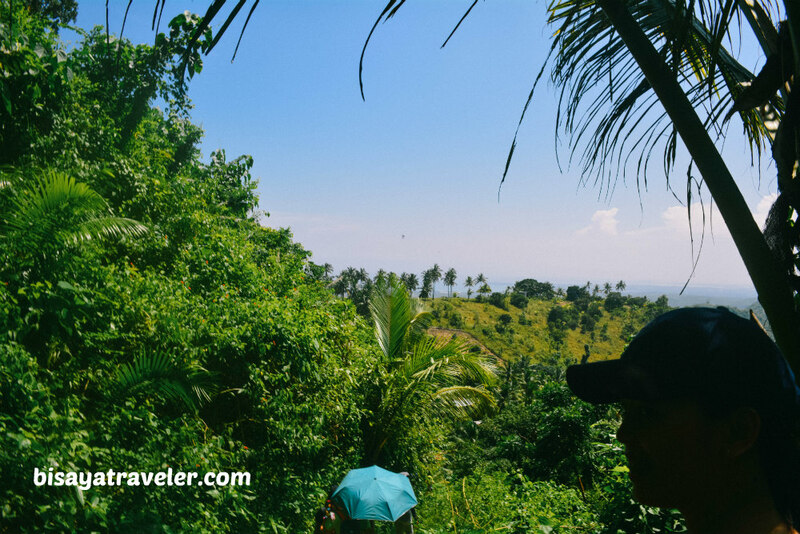 Moments later, we arrived at one of the region’s most interesting spots – a quarry with a sweet view of Mactan Island. 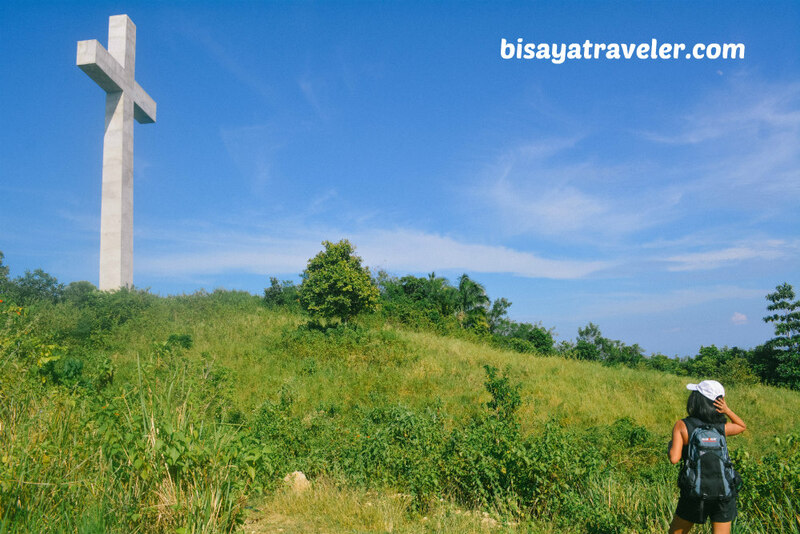 From the summit of the quarry, we also got a clear view of Holy Cross Tagaytay. As we were talking to Demi’s uncle, we found out that it might not be possible to hit Mulao River and Holy Cross Tagaytay in one day. Even though we’re no slouch, when it comes to hiking, we spend too much time on taking pictures, to immortalize the moments of our adventure. And so, we voted to visit Holy Cross Tagaytay, instead of hiking our way to Mulao River. 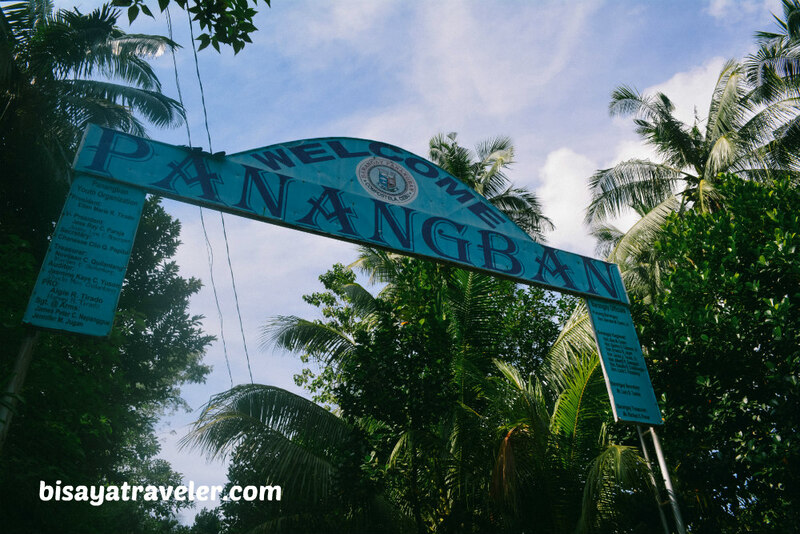 We, then, resumed with our hike, made a couple of stops, and arrived in Buntod Panangban. Once there, we admired the view, snapped a bunch of photos, and relaxed amid the scorching heat of the sun. What’s more, we talked quite a lot about life as well as Idol’s “bump in” escapades with some of joiners of our group. We asked Idol some things, including the reason why he likes girls with names that start with letter M, like Marzi, Marimar, and Madas. 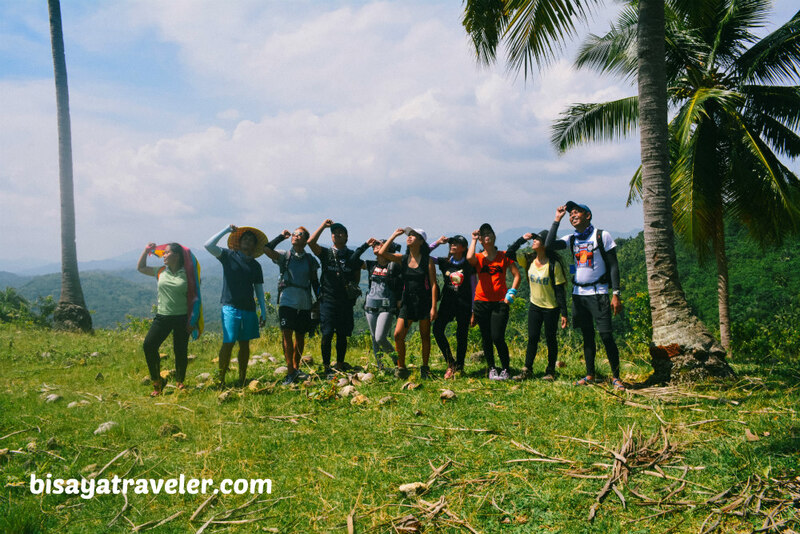 Before moving on to our next stop (the highest peak in the area), we did the Idol pose in Buntod Panangban, as a group. On the way to our next stopover, the gang had several interesting conversations, from trips abroad to major climbs within the Philippines. 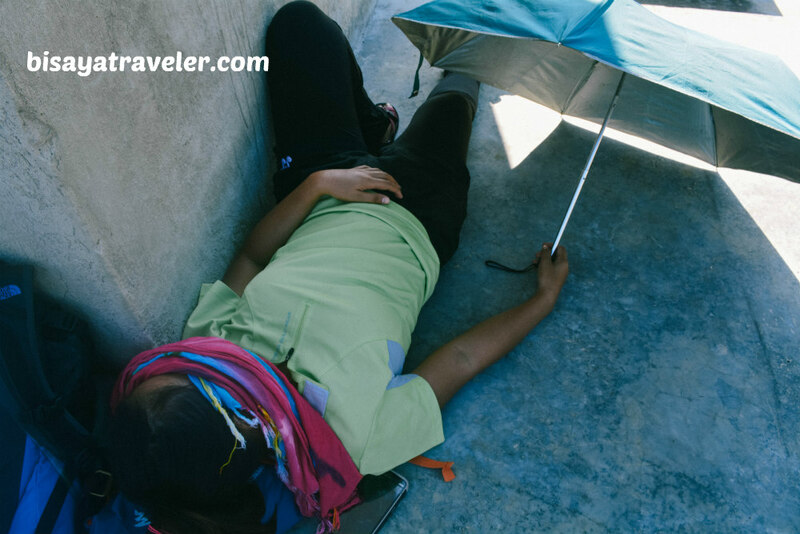 To me, however, the most memorable conversation on our hike was Jovy’s confession of her not-so romantic affair with an Indian owner of an inn in Hong Kong. While nothing Rated SPG happened in Hong Kong (according to her), we fabricated some fictional events and lines to add a dose of humor to her story. One of which was the inn’s owner saying “I’ll show you my puppy”, which was completely not true. And that puppy thing just set the tone for the entire hike. Folks, I’m a bona fide introvert, but sometimes I become a rascal who annoys or amuses people with my witty jokes. Later on, we arrived at the area’s highest peak. Unfortunately, the area is literally covered in bush, meaning there’s no great view to take a photograph. But, it was totally fine to us. After all, we need to burn tons of excess calories, with most of us getting bigger waistlines. As we were resting on top, Demi revealed to us that one of her friends has a crush on Team Bang’s undisputed heart-rob – Kevin. And, boy, that dude is really on fire, stealing girls’ hearts with his charm, mustache and mysterious aura. If Kevin and Idol would team up, they would form a deadly dynamic duo that will sweep girls of their feet with one killer smile or Idol pose. It would be a dream pairing for girls, and as momentous as Lebron James and Michael Jordan in one team, Empoy and James Reid in one flick, or Pacman and Super Mario in one game. When these guys combine forces, they would send chills to the spines of the adventurous girls, and make them as energetic as a group of kangaroos that drank Cobra Energy Drink and Lipovitan in one outing. Since it was almost lunchtime, we decided to descend, and take a breather at a barbecue store near the mountain’s base. From there, we ate our lunch, took a breather, and talked about different breeds of puppies. 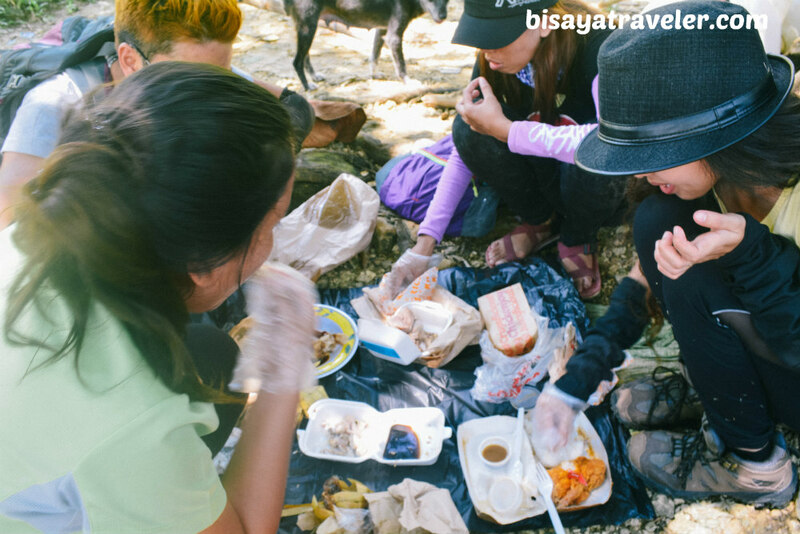 Jovy, who said she was on a strict diet, was on an eating spree, munching on the crispy and meaty slices of lechon. 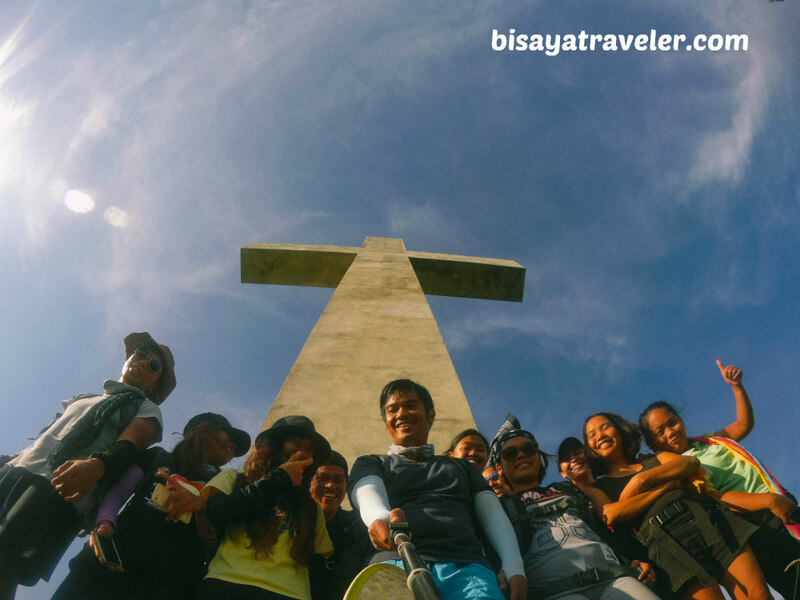 With lunchtime over, we hit the trail leading to the undisputed highlight of our trip in Compostela – Holy Cross Tagaytay. The first part of the trail to Holy Cross was relatively easy, even with all the slippery spots. Not to mention, there are heaps of beautiful sights, making the hike less painful. Eventually, we arrived at this abandoned rustic hut, and took a short rest. Later on, we went on with our hike, and took on the seemingly non-stop assault to the top of Holy Cross Tagaytay. The hike up to Holy Cross was a bit more difficult than what I anticipated. 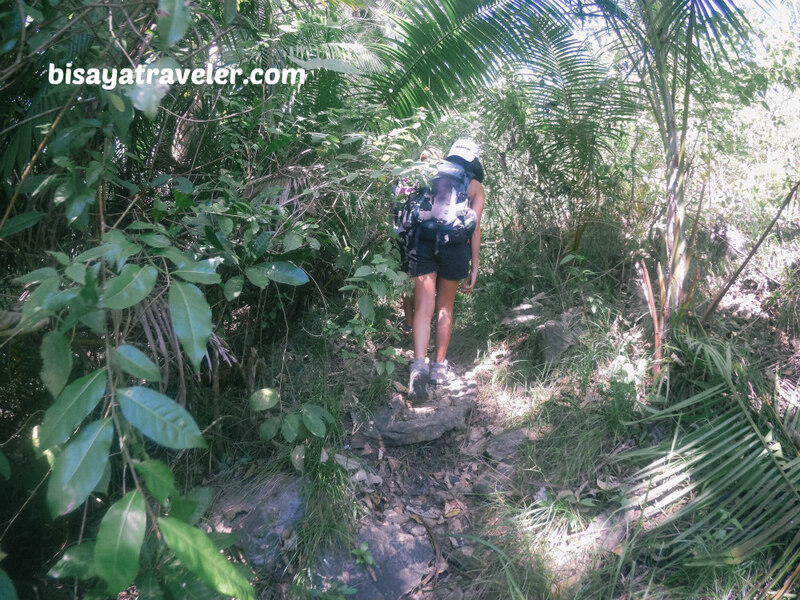 With thorny plants, sharp rocks and a bushy trail, the hike can be challenging for those who are not used to hiking. 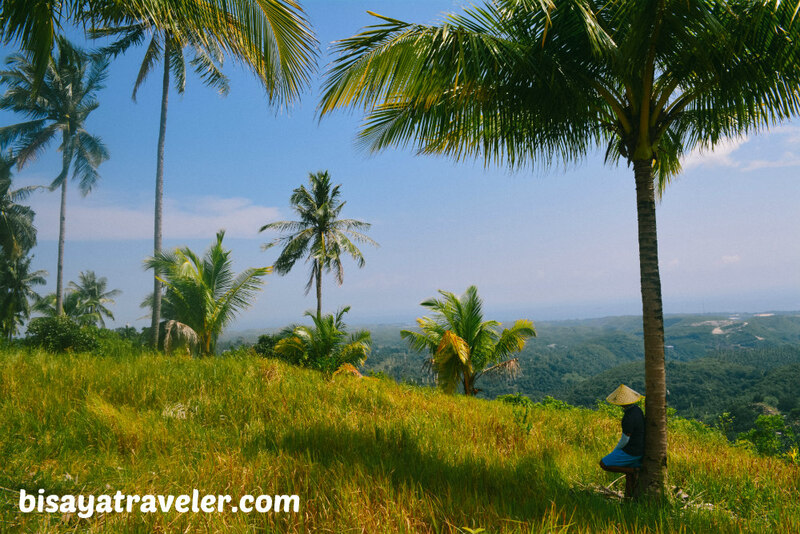 But as I’ve said before, there’s no place too steep or far for people who’ve got the travel bug. Every time a challenge arises, we just let our fun, free spirit take over, and conquer it one step at a time. And after minutes of walking, we, ultimately, got a closer look of the humungous Holy Cross. Clearly, we were utterly amazed by the sheer size of this crucifix. Even from afar, the Holy Cross looks colossal. “It’s absolutely the biggest cross I’ve seen, and I’m amazed”, said Demi. 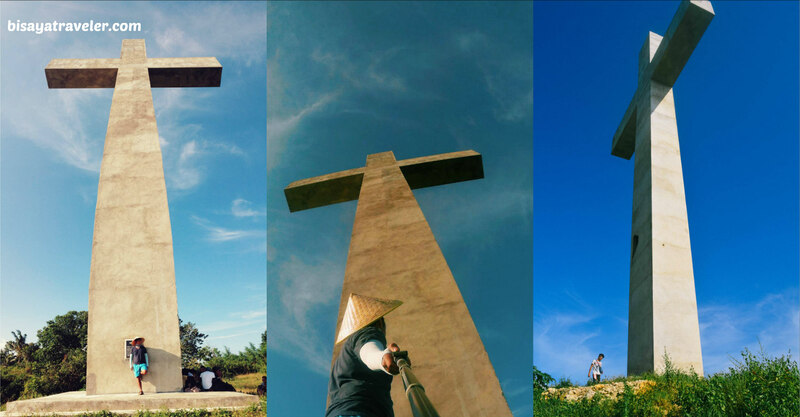 And, as far as I’m concerned, Compostela’s Holy Cross is Cebu’s biggest crucifix. I’ve been around Cebu, and I’ve never a cross as big as this one. 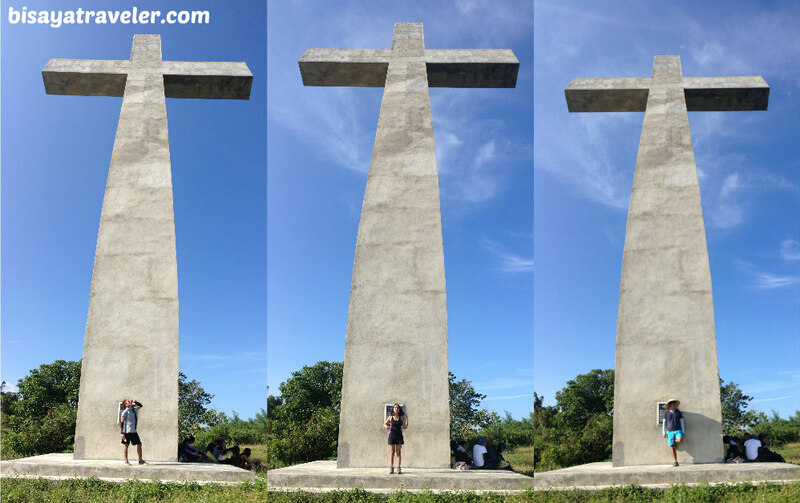 I might be wrong, but so far, I’ve never seen a cross in Cebu bigger than it. By my own estimation, it’s at least 30 feet tall. We, then, took a handful of steps closer, and took tons of photos of it from different angles. Later on, we made our way to impressive cross, and soaked up the views from above. The others, meanwhile, had a long rest, with the cross serving as a shade protecting us from the sun’s heat. Jovy even had a short nap, and was probably dreaming of cute puppies in Hong Kong. With its incredible size and wondrous views, I couldn’t stop admiring the cross. Even Christine told me that I couldn’t stop talking about it. My mood was positive that I couldn’t stop doing fist bumps with Idol. And every time we did it, Demi would laugh at our comedic gestures. In some ways, Holy Cross reminded of “Christ the Redeemer” in Rio de Janeiro, Brazil. 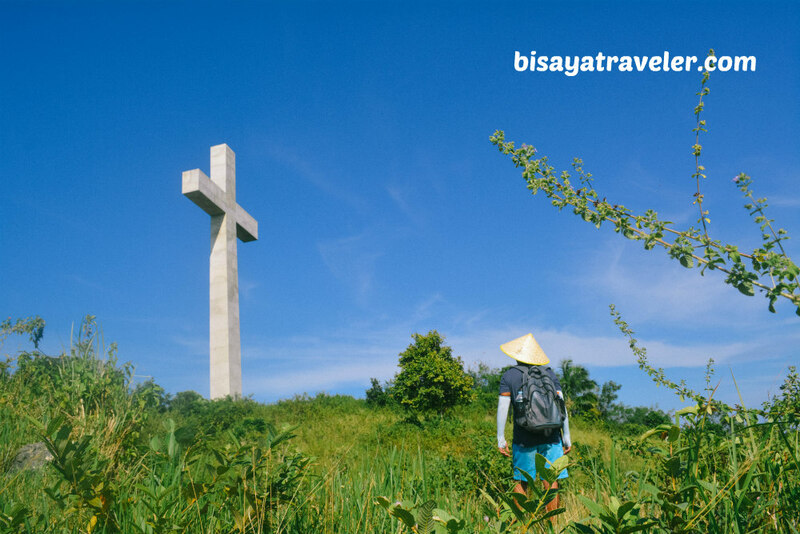 And, as I’ve found out later on from a habal-habal driver, the owner of Holy Cross Tagaytay was actually inspired by Rio’s renowned landmark. Though it was still early, we had to head back to our base because Tine and Sheng wanted to end our hike with a dip at a refreshing spring resort. But, before leaving Holy Cross, we took a crowded group photo with the Holy Cross on the background. Soon after, we descended from Holy Cross, and went on a thrilling hike to Demi’s home via a challenging trail. We, ultimately, capped off our day hike on a high note with a visit to a beautiful spring resort. 10:30 AM: ETA Buntod Panangban. From Sungold near SM City Cebu, take a jeepney ride bound for Danao, and ask the driver to drop you off at Compostela Public Market (Fare is PHP 25 per person). 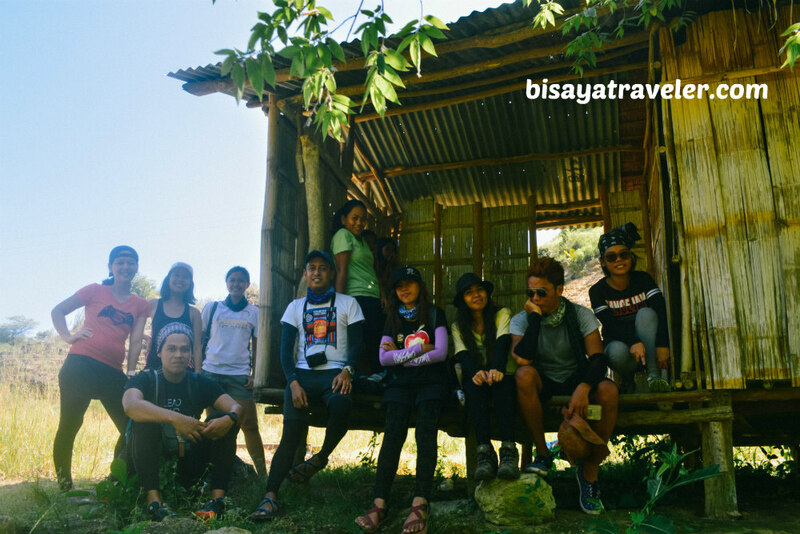 Then, take a habal-habal ride to Dikyop (fare is PHP 20) – the base of your hike. Once there, ask the locals for directions to the Holy Cross. 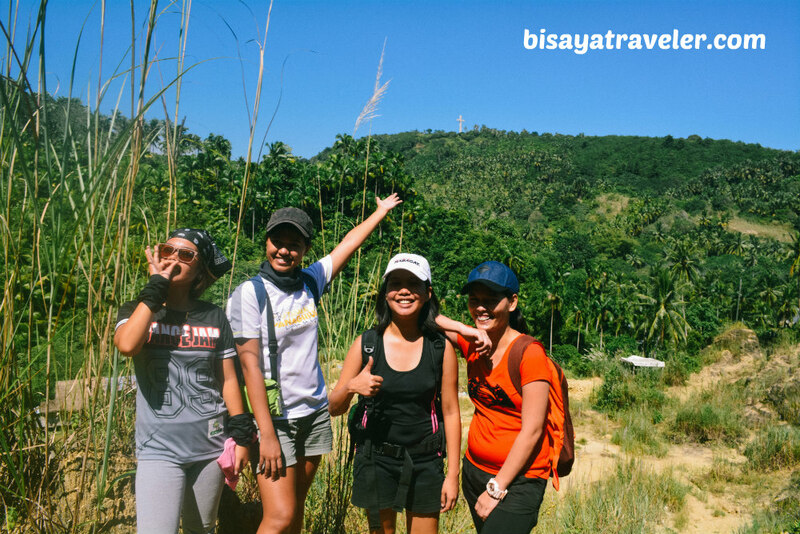 If, however, you’re not comfortable hiking without a guide, ask help from Demi, and reach out to her at 0918 780 2750 or through her Facebook page. 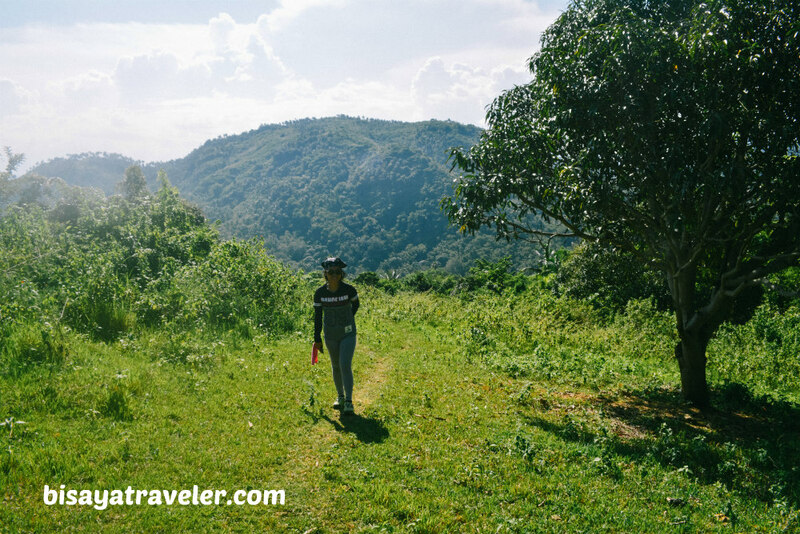 She knows a guide that can help you get to Holy Cross Tagaytay. Bring trail food and at least 2 liters of water. Pack ion beverages like Pocari Sweat or Gatorade. Pack sunglass, hat and armguards to protect your skin from the sun and prickly plants. Remember to greet the locals, when hiking. One day, people are going to nickname it as the “Mount Tapyas of Cebu”. 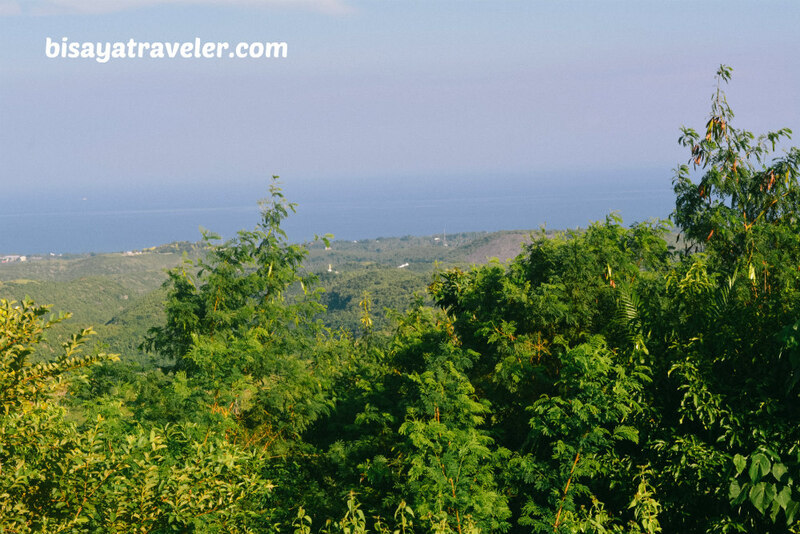 “Mount Samal of Cebu” or “The Rio de Janeiro of Cebu”. For now, though, Holy Cross is an offbeat landmark that only the locals and intrepid hikers are willing to see up close. And, just like our life, getting there won’t be easy, but you’ll be rewarded with a sense of accomplishment and joy, once you reach the top.